The Shakespeare Fast Lock Snap Swivel allows you to quickly and easily change your lures and terminal tackle when freshwater or saltwater fishing. These snap swivels make it quick and easy for you to change your lures. You can also use them to change terminal tackle like leads and floats. The wire over wire lock and strong, durable construction makes these snaps extra tough and durable. 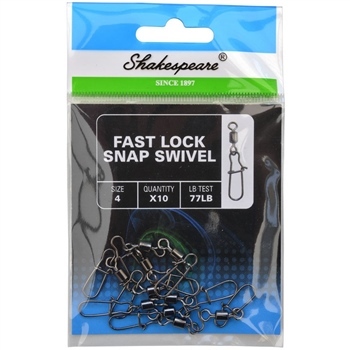 The Shakespeare Fast Lock Snap Swivel is available in various sizes and is supplied with 10 per pack.